Imagination and innovation have the ability to inject huge and diverse cooperative matrices. The China International Import Expo has afforded a variety of opportunity and facilitated heavy exposure for India China trade and economic cooperation. Unlike in years past, India and China are now actively and substantively engaging across three levels: local, national and regional. Both countries have been consciously working to make economic dents at very local levels. Memoranda on resumption of border trade are the policy instruments of this local penetration. The Lipulekh Pass trade route that connects Dharchula-Pithoragrah in Uttaranchal with Taklakot in Purang County of Tibet Autonomous Region (TAR) and Shipkila Pass that connects Namgya-Kinnaur, Himachal Pradesh with Jiuba in Zada County in TAR opened in 1992. The Nathu La Trade Route connecting Sikkim in India and TAR in China was reopened after 44 years in 2006. The 2005 Nathu La Trade Study Team Report projected that with the availability of a certain level of trade facilitating measures, India China border trade from Nathu La route would reach US$2.84 billion by 2015. However trade volume has been almost negligible because of factors such as restrictions on tradable items, poor road conditions and inadequate infrastructural facilities. Nevertheless, tourists now visit to witness how trade actually takes place at Sherathang in India and Renqinggang in China. Over the last couple of years, Nathu La Pass itself has become a major tourist spot with hundreds of people visiting the border and enjoying the pleasure of shaking hands with Chinese soldiers. Interestingly, China has already extended its railway line from Lhasa to Xigatse and is likely to connect to Nathu La by 2020. India is also working to pave a two-lane highway up to Nathu La and a railway line to Rangpo. Greenfield Airport at Pakyong in Sikkim is now functional. All these facilities are well connected to the Golden Quadrilateral highways of India. Kalidasa once wrote that the waters of Lake Mansarovar are ‘like pearls’ and that to drink them erases ‘the sins of a hundred lifetimes.’ Prime Minister Modi and President Xi Jinping jointly introduced a new dimension to the Nathu La trade route when they decided to reopen the far-reaching pilgrimage project to Kailash Mansarovar through Nathu La in 2014. Since it was launched in 2015, large numbers of pilgrims have already done Mansarovar parikrama (circumambulation) at an altitude of 15,157 feet through the SherathangKangma-Lazi-ZhongbaDarchen-Qugu route. This roughly 1,650-km route reduces the distance, trip time and physical hardship involved in alternate routes like through the Nepal China border town of Khasa (Tatopani) or a difficult trek from Taklakot in Uttarakhand. This trade route is one of the most magnificent eco-tourism routes and offers deep inroads into bio-diversity hotspots and a glimpse of glaciers and water towers and the cultural ecology of borderland communities. This initiative finally reconnects the cultural heritage of two civilizations and rebuilds Asian conﬂuence. As confidence and trust between India and China further consolidates and tourism expands, this trade and pilgrimage route could eventually be used by neighbouring countries like Nepal, Bhutan, Bangladesh, Sri Lanka and Myanmar for both trade and tourism. Tibet is no longer just a market for religious and cultural items. It is one of China’s most attractive tourism destinations. Tibet and the surrounding regions including Sichuan, Yunnan, Qinghai and Chongqing are a growing market snapping up goods ranging from cement to the latest cars and from caterpillar fungus to tulips. Development and investment officials and private sector players from Yunnan Province have made several trade visits to the Eastern states of India including West Bengal and some of the eight North Eastern States. The sole agenda item of the “Kunming Initiative” is to establish trade and investment linkages with the vast untapped market and naturally contrasting and well endowed regions of eastern India. Even if trade and investment happen primarily in traditional medicinal systems, the entire sub-region will ﬂourish in the name of organic and natural products. This fits very well in India’s Act East Policy. This primary notion of ‘local engagements’ and the usage of trans-local actors, which are inherent to the geo-economics of the Kunming Initiative, are new things for the Indian Government to address. At the national level, the economic interests of India and China further align. India-China trade has steadily increased from a mere US$270 million in 1990 to a staggering US$84 billion in 2017. However, India has amassed a colossal trade deficit with China of US$51.1 billion in 2016-17. More seriously, despite India’s growing status as a manufacturing hub, its exports to China remain overwhelmingly primary commodities: raw or semi-raw materials such as cotton, copper, iron ore, organic chemicals and other minerals. And its imports are largely finished products like telecom equipment, electrical machinery, computer mobile hardware and fertilizer. This imbalance is the target of Prime Minister Modi’s “Make in India” Initiative. The country would rather have its raw materials be used by domestic production bases and see greater value-added benefits in its exchange with global markets. Can the “Make in India” campaign go global? Can China transfer some industrial production to India? Given the vociferous protectionist policies and inward-looking trends in the U.S., can India and China together lead from the front? The Chinese would benefit tremendously from market access to India and in specific areas like imports of pharmaceuticals, software, primary commodities like cotton, rubber, iron ore, bauxite, mica and even semifinished engineering and chemical goods. New frontiers of innovative cooperation are likely to emerge. The two way investment links between India and China are deepening. If top mobile phone brands like Oppo, Huawei and Xiaomi are manufactured in states like Gujarat, Karnataka, West Bengal and Assam and marketed as part of the “Make in India” pools of popular products, their access to entire SAARC and ASEAN region under various free trade agreements could also be harnessed. Could the competitively priced variety of Indian dairy products cater to milk and yogurt hungry Chinese provinces? These are all people and community centric projects that foster mutual warmth and collaborative sustenance. For a long time, China remained focused on Southeast, East and Central Asia. However, China along with the U.S., E.U., Japan and South Korea have been given the observer status in SAARC. 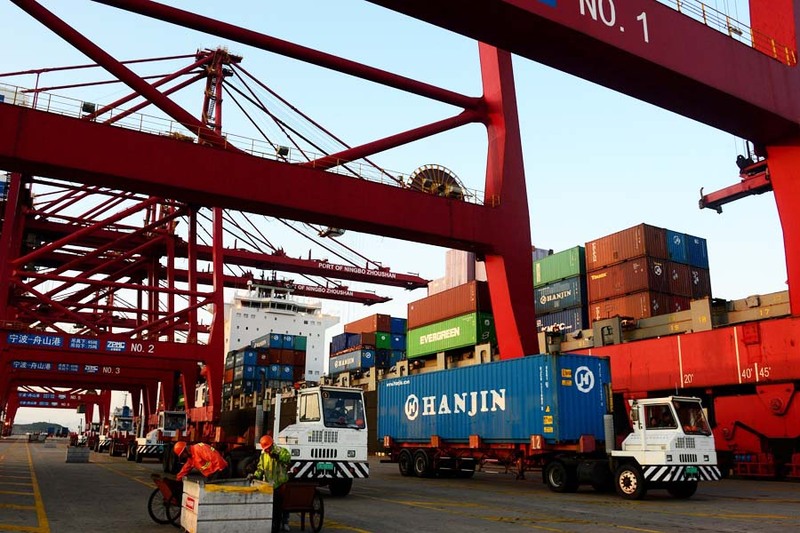 China’s trade with South Asia has witnessed unprecedented trajectory growing from a mere US$1.18 billion in 1990 to US$12.07 billion in 2003 and US$111 billion in 2015. China has become the largest trading partner of India, Pakistan, Bangladesh and Sri Lanka. Thanks to the gigantic US$56 billion China-Pakistan Economic Corridor, six of SAARC’s eight members who are signatories to China-led Asian Infrastructure Investment Bank (AIIB) and Belt and Road Initiative project could welcome a massive inﬂow of infrastructure funds in South Asia. This is a sector in which China and India need to abandon their outdated one-upmanship. If the two countries decide to move together, South Asia will be the biggest gainer and become a region to reckon with. Then the question of China’s membership of SAARC will only oscillate between dejure presence or de-facto entry. Whether China wants to enter this regional ‘block’ from outside or inside would largely become academic. Then a grand interdependent venture like a Regional Comprehensive Economic Partnership could become a formidable pivot for both China and India. Imagination and innovation could inject huge and diverse cooperative matrices. For instance, unlike the traditional national security based treatment of Indian and Chinese projects in Nepal, the relationship has shown ample opportunity for trilateral ventures. Both India and China have developed a huge network of power grids and transmissions lines that not only provide access to various demand centers in their domestic markets but could possibly provide connections to neighbouring countries. The Super Grid concept and Smart Grid provisions have made grid interconnection and market access both economical and easy. China’s plans to build bulk power hybrid grids by 2020 to make “trans-regional, large capacity, long-distance and low loss transmission” a reality. India’s first national grid to national grid interconnection with Bangladesh through Behrampur-Bheramara grid opens a whole new theatre of cooperation. With Nepal, the 400KV D/C Muzzafarpur – Dhalkebar connection has been launched. Both these countries are now moving towards renewable energy because of global and domestic pressures to reduce usage of fossil fuels and cut emissions. Nepal is particularly rich in renewable resources. There have been protracted negotiations between India and Nepal to harness Pancheswar, Rapti and Karnali in addition to the signing of the Mahakali Treaty. China has shown keen interest to invest as well. Could a series of trilateral ventures cater to South Asian and South East Asian Markets? India and China have effectively participated in a wide range of power development projects in Nepal in the past. These include Indian projects like Gandak (15 MW), Trishuli (21MW), and Devighat (14.1 MW) and Chinese Sunkoshi (10.05 MW). India and China are gradually becoming rooted in each other’s diverse provinces and making deeper inroads into their own political culture and social dynamics. Negative stakeholders are gradually marginalized. Active economic diplomacy must be perpetual like military arsenals are preserved during peace time. Economic inter-dependence will be the most lasting and beneficial strategy. The author is a senior professor in the School of International Studies in Jawaharlal Nehru University, New Delhi, and until recently, served as a high-end expert at the Institute of South Asian Studies at Sichuan University, Chengdu, China. He also served as a member of the India’s National Security Advisory Board and founding vice chancellor of Central University of Sikkim. Presently he is India’s nominee in the Eminent Persons Group on Nepal-India Relations set up by the Prime Ministers of Nepal and India in 2016. His most recent publication is a coauthored book India China: Rethinking Borders and Security published by Michigan University Press, US, 2016.